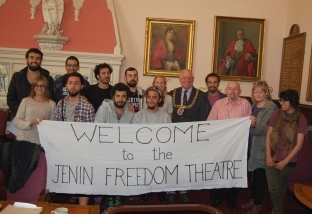 Hastings PSC presents the Freedom Theatre of Jenin and its production of the Siege. 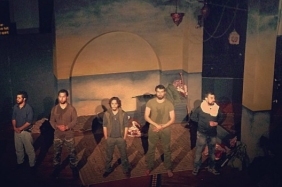 The play portrays the 39-day siege in Bethlehem in 2002 during the Second Intifada. Invading Israeli forces drove more than 200 Palestinians - civilians, local police and resistance fighters - to seek sanctuary in the Church of the Nativity. 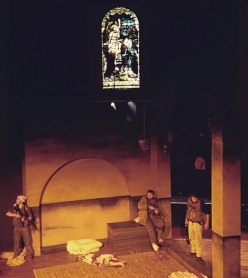 The play centred around 6 trapped fighters, beginning with the dramatic and chaotic arrival in the church and ending with the anguished negotiations over whether to fight to the bitter end or to accept exile. The production used archive film footage, monologues and dangerously realistic shooting and bombing effects to evoke the tense atmosphere within the church. The play turned out to be a powerful, emotionally charged example of cultural resistance at its best. The play was clearly a triumph with the audience giving the cast 3 rousing standing ovations. We are sure that audiences throughout the UK have been inspired by this example of outstanding radical theatre. 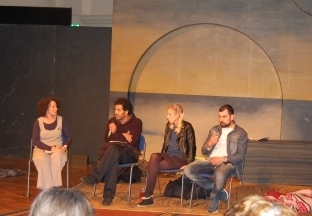 There was a Question and Answer session after the performance with directors Nabil Al-Raee and Zoe Lafferty, cast member Ahmed Tobasi, chaired by Polly Gifford, Cultural Strategic Development Manager with the Hastings Council. A film of the Q&A session after the Battersea Arts Centre performance with Nabil, Zoe, cast member Faisal Abu Alheja, joined by actor Samuel West and comedian/activist Jeremy Hardy can be seen here. Hastings PSC invited the Freedom Theatre to Hastings. St Mary in the Castle is an ideal location for 'The Siege,' not only for its incredible atmosphere, but also for the fact that it was originally a church. We would like to thank everyone at St Mary for all the hard work they put into the event. The first visit the Freedom Theatre crew made on arrival in Hastings was to the Town Hall where mayor Bruce Dowling gave an official reception (above photo). They were also made honorary members of the Hastings branch of Unite, the largest trade union in Britain. On the day of the performance we made sure that the 'crypt' area at St Mary was full of information about the Palestinian struggle, the BDS movement; and was bedecked with Palestinian flags; also an exhibition of Carlos Latuff posters (see photos below). The 2nd Intifada was triggered by Ariel Sharon's visit to the Temple Mount in Jerusalem in September 2000 with 1,000 armed police. This provocation, along with decades of Israeli occupation, land theft and failed peace agreements, brought about protests throughout Gaza and the West Bank. In 5 days at least 47 Palestinians were shot dead by the Israeli forces The Palestinian people rose up: the second Intifada had begun. During the Second Intifada, Israel re-occupied all the West Bank cities: the army proceeded to systematically destroy the infrastructure and the whole fabric of Palestinian life, by means of house demolitions, bombarding of refugee camps, looting, mass arrests and targeted assassinations. Whole neighbourhoods were razed to the ground. The economies of both the West Bank and Gaza were ruined. The Palestinians had suffered years of injustices since the 1948 Nakba, intensified by the occupation from 1967 onwards. Diplomatic negotiations after the first Intifada had resulted in the signing of the Oslo Accords in 1993, which aimed at a two state solution after five years. Palestinian expectations were that they would then be able to attain self determination and statehood. 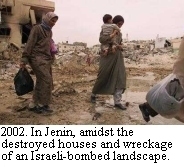 But during this period, the Occupation had intensified: further land confiscation; increased settlers and settlement building; by pass roads; house demolitions; control of borders, freedom of movement and ethnic cleansing of East Jerusalem, leaving Palestinians with a sense of disbelief that they would ever achieve independence through diplomatic means. Since the end of the Intifada in 2005, prolonged and fruitless peace talks have been held and the reality is that Palestine is in a worse position than it was in 2000, with no hope of an independent state in the near future. 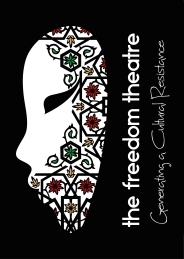 The Freedom Theatre was built in the heart of the Palestinian resistance in the Jenin Refugee Camp in 2006. The aim was to create a political and artistic movement of theatre and filmmakers who could fight the Israeli Occupation through art and use cultural resistance as a tool to fight oppression. Due to the provocative nature of the work, the theatre has had its building in Jenin attacked, received numerous death threats, had its members interrogated and imprisoned and in 2011 the theatre's Artistic Director Juliano Mer Khamis was murdered. Despite this the theatre has managed to tour their work internationally as well as open many productions in Jenin Refugee Camp where it is based. "It was tragic and comic, touching and humbling"
"a heart-wrenching, profound cri de coeur from the heart of the occupation"